Welcome to the next stop on Magical Blogorail Green . Today we are discussing why Cinderella’s Royal Table is my pick for the most romantic Disney restaurant! Dinner inside Cinderella Castle is a very romantic occasion! 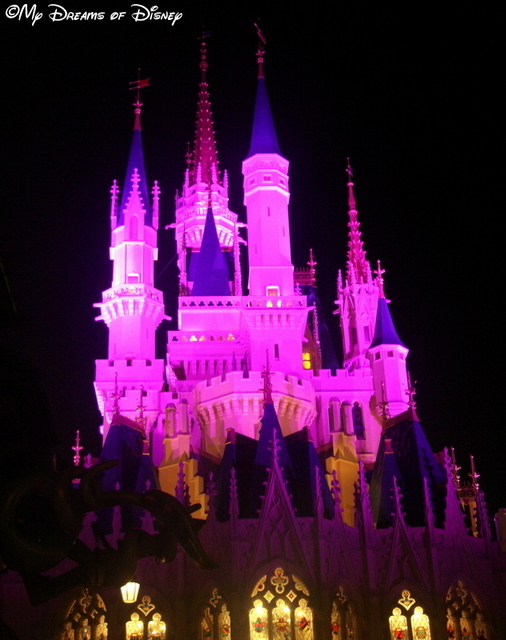 Ah, Cinderella Castle and Valentine’s Day. Two words that were made for each other when it comes to romantic encounters. 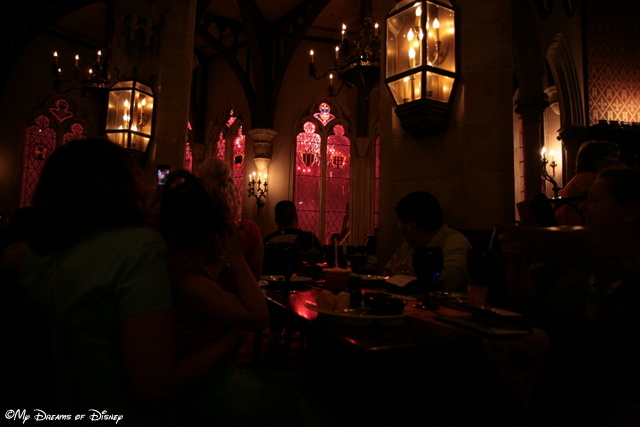 In this month’s Blogorail post, we are talking about our most romantic Disney restaurants — and for me, I immediately thought of Cinderella Castle! For those that don’t know, inside the walkway between the front and the rear of the Castle is a dining location called “Cinderella’s Royal Table”. If you have reservations for this location, you will get to enjoy a wonderful meal on the second floor of the Castle. Certainly, the restaurant is primarily a kid friendly restaurant — there likely won’t ever be a time when you are eating there when there aren’t some kids enjoying breakfast, lunch, or dinner there. However, that doesn’t mean that the experience isn’t romantic. When two people are in love, the world truly does kind of fade away into the background because they only have eyes for one another. I remember way back in 2001 my wife Cindy and I went to Walt Disney World before our daughter Sophie was born, and we were able to get a lunch reservation the day we were there! As certain as I was that there were children there while we were eating, I don’t remember that at all — because I only had eyes for my wife. Fireworks exploding around the Castle. Image courtesy my friend Neal. The last time that we ate at Cinderella’s Royal Table was in 2012 when we visited with our friends Neal and Kerry, their kids, and our friend Monica and her daughter. We made a reservation for the restaurant, and I was disappointed that the time we could get was 8:40PM. However, as I discovered and wrote about here, that time was a blessing in disguise, as we were inside the Castle when Wishes was performed, and we had a very romantic and unique location to view it from that I had never experienced before! 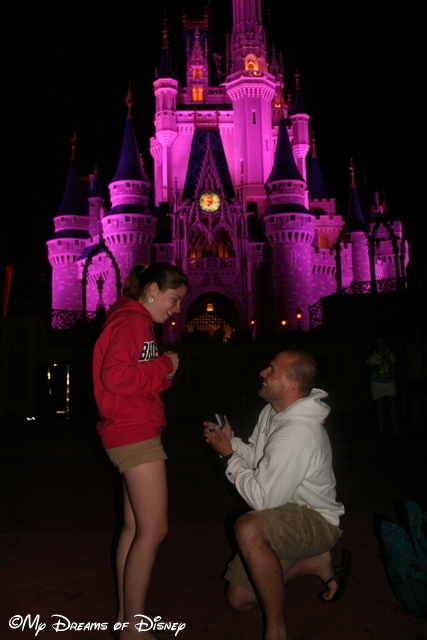 Also, if you are considering proposing to your special someone, then Cinderella’s Royal Table or the vicinity of the Castle are the place to do it from! You can schedule a special dinner for you and your loved one, and they can even put the ring on the plate as part of your dessert course, or you can improvise yourself and ask her in front of the Castle, like what happened with my niece Stephanie and her husband Shane. Shane proposing to my niece Stephanie! As you can see, romance truly does live at Cinderella Castle and Cinderella’s Royal Table! Thank you for joining me today. Your next stop on the Magical Blogorail Loop is Adventure in the Great Wide Somewhere. We still haven’t visited Cinderella’s Royal Table yet but I really want to. I think we’ll try to get a time during Wishes. It sounds like a great experience! I think you will like it, Melissa! Look for a time later in dinner to get the Wishes experience. We were with a large group, so the dinner was longer than normal — if it’s just the two of you, see about getting a window seat and you might want to make your reservation closer to the start of Wishes for that evening. Wow! Look who’s Mr. Romance, eh? Your wife is a lucky woman my friend. Would you say breakfast, lunch, or dinner is better at this restaurant? I would say that dinner is best, simply because of the experience we had with Wishes. I’ve not eaten here for breakfast, though, so that may actually be the better time to go because then you can get great shots of the Castle with no people if you book it for before the Park opens. Thanks for commenting! As a Mom of 2 boys we have not yet eaten inside the Castle. But it is definitely on my Must Do list. I can certainly understand that, Patricia. Thanks for commenting! The last time I ate at Cinderella’s Royal Table I was 11, and all I remember is that the chicken nuggets were shaped like dinosaurs, which I found strange. I keep trying to get the guys in my life to make a trip to dine with Cindy, but for now the 5 year old is adamantly anti-Cinderella. It’s on my list though!